Some of our greatest memories are linked to the senses: sights, sounds and tastes among them. 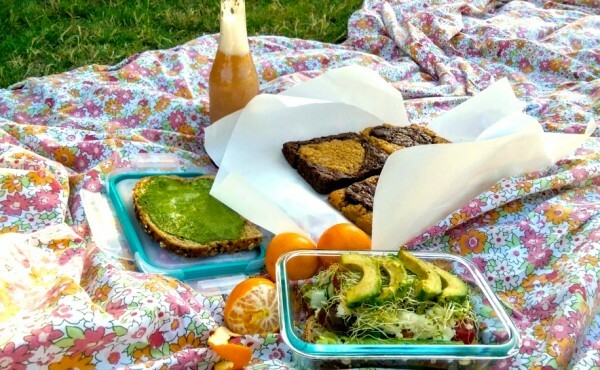 At free Levitt concerts, sharing food with friends and family while listening to live music together under the stars makes for a memorable mix of all three, which is perhaps why Levitt lawns are often filled with picnicking concertgoers. 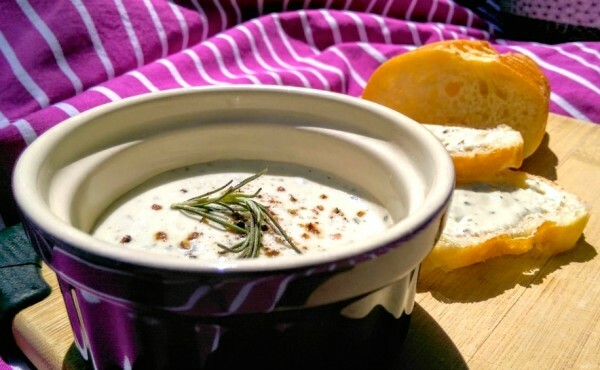 Liven up your next picnic on the lawn with these easy, delicious recipes, inspired by upcoming Levitt concerts, and enjoy your own lovely intersection of the senses. August 20, 2015 at 7 p.m.
It’s all about that brass with this Chicago marching band that thinks that it’s a rock ‘n’ roll band. Much like Mucca Pazza’s brass section, this tubular menu blasts out color and character with an attitude. 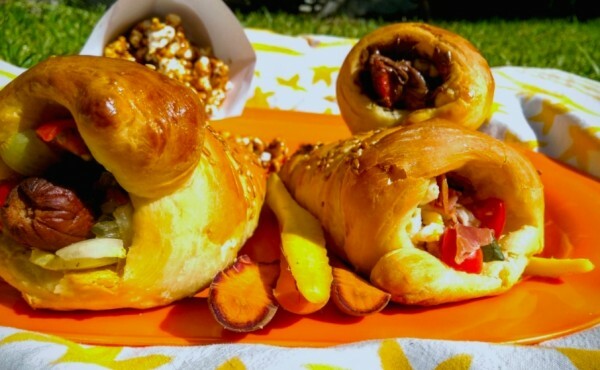 Be as eccentric and genre-bending as the band when exploring the endless possibilities for these bread cones, and be sure to save the paper cones used to shape your bread for plating hot caramel corn—which is particularly pleasing to the taste buds when paired with a basil lemonade to cool that spice. In a large bowl, mix flour with sugar and salt. Dissolve yeast in warm water and add to flour mixture. Add eggs and milk and mix everything together. Add butter and knead until dough is smooth and soft. Cover with a dishtowel and let it rise for about 1 hour in a warm area until doubled in size. Prep cone molds by taking 2 sheets of paper and making a cone. Fully cover the paper cone with aluminum foil. Make 8 cone molds. Once dough is ready, punch it down and on a floured surface, divide into 8 equal parts. Rest dough for 5 minutes. Roll each piece into an about 30” rope. Roll ropes around cone molds. Place onto a parchment-lined cookie sheet and rest ropes for about 20 minutes. Meanwhile, you can preheat the oven to 400 degrees F.
Brush cones with the beaten egg and top with sesame and flax seeds. Bake for about 16-18 minutes until golden brown. Cool on wire racks and fill with your favorite filling. Lightly coat two large, heatproof rubber spatulas, a very large mixing bowl and two large baking sheets with nonstick cooking spray or a thin slick of oil. In a large saucepan or pot with a lid, heat oil over medium-high heat. Add popcorn kernels, cover and keep the saucepan moving until all kernels have popped, about 5 minutes. Transfer to the prepared bowl, removing any unpopped kernels. Toss with salted peanuts if using. In a small bowl, whisk together the baking soda and cayenne pepper. Have the two large baking sheets ready. In a medium saucepan, combine the sugar, butter, salt and ½ cup water. Cook over high heat without stirring until the mix becomes a light golden-yellow caramel, 10 to 14 minutes. Remove from heat and carefully whisk in the baking-soda mixture (the mixture will bubble up). Immediately pour the caramel mixture over the popcorn and don’t fuss if it doesn’t all come out of the pot — you’ll have plenty. Working quickly and carefully, use prepared spatulas to toss the caramel and popcorn together as if you were tossing a salad, until the popcorn is well-coated. 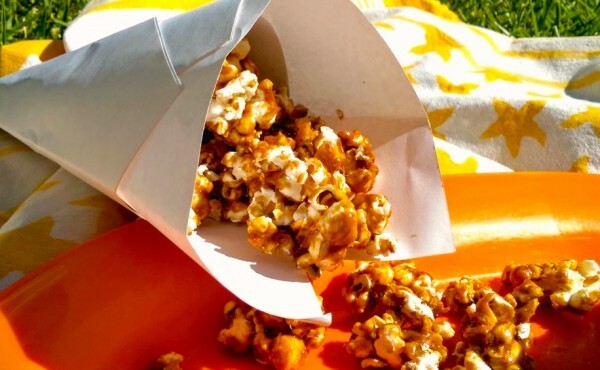 Spread popcorn onto baking sheets and quickly separate them into small pieces while still warm. Cool to room temperature, about 15 minutes. Once cool, store in an airtight container for up to two weeks. Basil Simple Syrup: In a saucepan combine basil, sugar and water and simmer until the sugar is dissolved, 5 minutes. Cool, strain the simple syrup and store in the fridge. 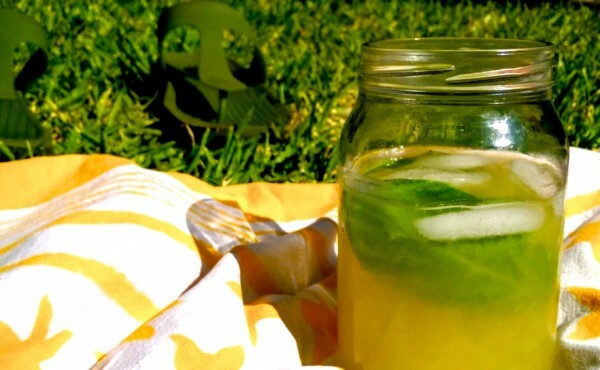 Mix lemon juice, Basil Simple Syrup and water together in a pitcher. Store in the fridge until ready to serve. Pour over ice-filled glasses and garnish with a lemon twist. September 4, 2015 at 11:30 a.m.
Picnic “Under Paris Skies” with a menu inspired by this swinging hot club jazz quintet from Seattle. 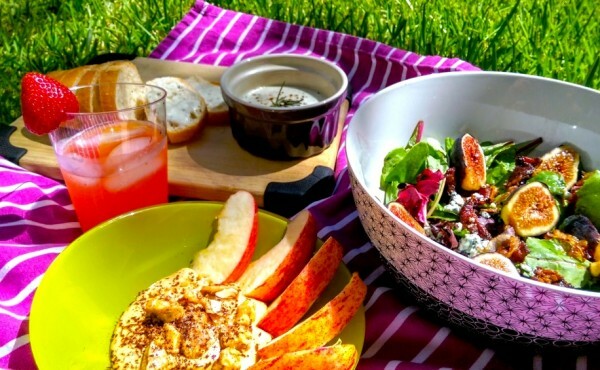 Turn leftover cheeses into a perfect partner for you or any baguette, marry sweet and savory flavors together in a fig, blue cheese and bacon salad and smile like apple wedges sitting on their skins with a caramel dip. 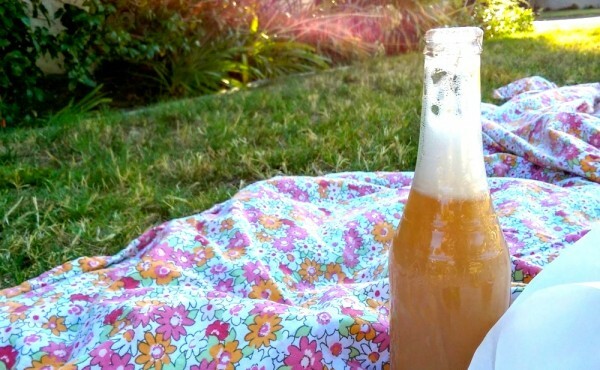 And while you’re swinging to the rhythm guitar’s “la pomp,” sip some picnic-perfect pink lemonade. Blend cheese, butter (if using) and garlic in food processor until combined. Drizzle in wine with the motor running until you get your desired consistency. Add herbs, pulsing machine until just combined. Season to taste with salt and pepper. Fromage fort can be used right away, or kept in the fridge until needed. In the fridge, it will thicken and age a little; the flavors will mingle and deepen. For dressing, whisk together vinegar, lemon juice, mustard and honey in a small bowl. Slowly drizzle in olive oil, whisking constantly to combine. Season to taste with salt and pepper. Cook bacon in a large skillet over medium-high heat until crispy. Transfer to a paper towel-lined plate and set aside to cool, then crumble into pieces. Add sliced shallots to hot bacon fat and fry until golden brown and crispy, about 1 minute. Take care not to overcook the shallots or they will become bitter. Remove with a slotted spoon and transfer to a paper towel to drain. Toss lettuce with dressing until evenly coated. 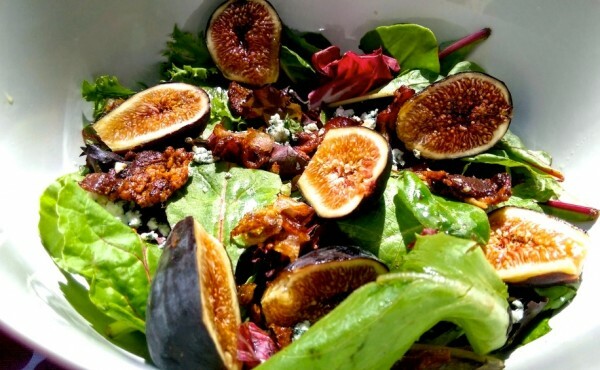 Divide among serving dishes and top with figs, bacon, shallot, and blue cheese. Measuring honey for the salad dressing can make for a sticky situation. To remedy, use the same tablespoon used for your oil to measure your honey and the honey will slide right off, making cleanup a breeze. 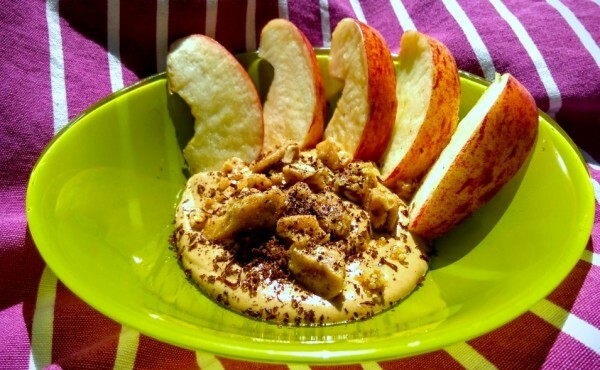 Keep apple wedges fresh and un-oxidized with squirts of lemon juice or storage in a tub of saltwater. Purée strawberries in a food processor until smooth. In a medium saucepan over medium-high heat, combine lemon juice, water, raw honey and strawberry purée. Bring just to a boil, stirring to make sure it's well combined. Pour the remaining 7 cups of water into a pitcher. Add lemon-strawberry mixture and stir to combine. Taste lemonade to see if it needs any modifications. If too sweet, add a little more water and lemon juice. If too sour add a little more water and raw honey. If too plain, add more lemon and honey. Refrigerate for a few hours until chilled. Serve over ice. September 4, 2015 at 6:30 p.m. Leftovers are unlikely with this set. “Smile Big” at a menu inspired by these Los Angeles cuties with a jazzy Prohibition-era inspired pop sound. Kick off your meal with some delightfully green sandwiches and feel your taste buds tingle with your own grape cola. After an evening of tapping your feet to the group’s vintage beat, wrap up your picnic with these white and dark hearted brownies that are almost as cute as the band. Make mayo: Combine all ingredients except lemon juice in a food processor. Purée smooth, about 2 minutes. Blend in the lemon juice. Chill until needed. Pickle onions: In a medium-sized jar, combine onion slices, vinegar, sugar, salt and peppercorns. Lid jar and let the mix sit for at least 10 minutes, shaking a few times to dissolve salt and sugar. Use immediately or refrigerate until needed, up to 1 week. Assemble the sandwiches: Toast the bread and spread both slices with a thick layer of mayo. 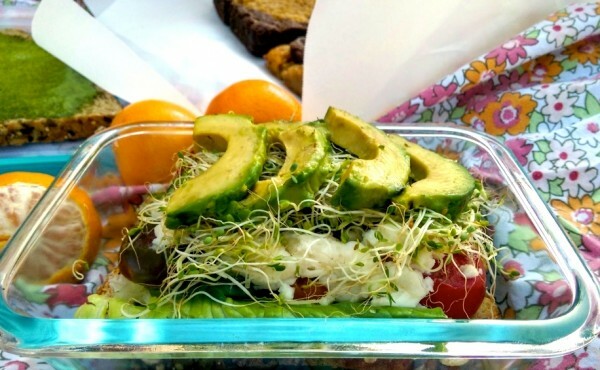 Top with avocado, mozzarella, tomato, cucumber, pickled onion, sprouts and lettuce. Sandwich with the other slice of bread and press down gently. Wash grapes and put them in a heavy bottomed pot along with water and lemon juice. Bring the pot to a simmer and continue simmering for about 2 minutes until the grapes have begun to soften. Smash grapes with the back of a large spoon as they cook. Transfer the mixture to a food processor. Let the machine run long enough to get all the grapes completely puréed. Pass purée through a mesh strainer, pushing lightly, to get the juice through. Discard any pulp, skin or seeds. Refrigerate grape syrup until cold. 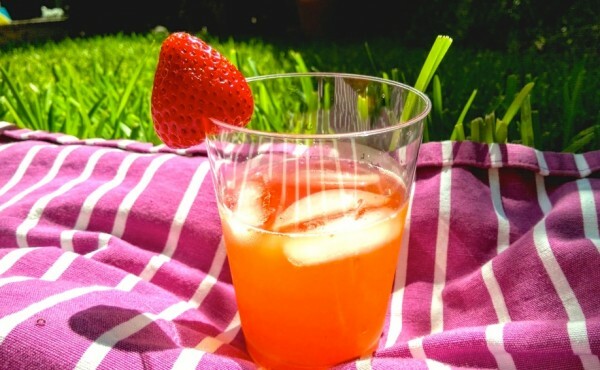 To serve, fill a glass with ice and mix half syrup and half sparking water. Garnish with a sprig of basil or mint. Preheat oven to 350 degrees F. Line an 8×8-inch square baking pan with foil, with ends of foil extending over opposite sides of pan. Repeat with second piece of foil in opposite direction. Butter foil. Melt white or semisweet chocolate and butter together in a large bowl over a simmering pot of water (or in the microwave in 30 second bursts, stirring between each) until it's 90% melted. Remove from heat and stir the mixture until smooth. Whisk in sugar. Whisk in eggs, one at a time, then vanilla. Add flour and salt together, stirring until just combined. Spread into prepared pan and bake for 25 to 30 minutes (for the semisweet chocolate version) and 30 to 35 minutes (for the white chocolate version). Repeat this recipe with the other kind of chocolate and a second 8×8-inch square pan. Cool pans on a wire rack in the freezer if you’re going to make cut-outs for clean cutting. Once solid, transfer brownies in their foil “sling” to a large cutting board and cut each pan of brownies into 16 even squares, about 2×2 inches each. 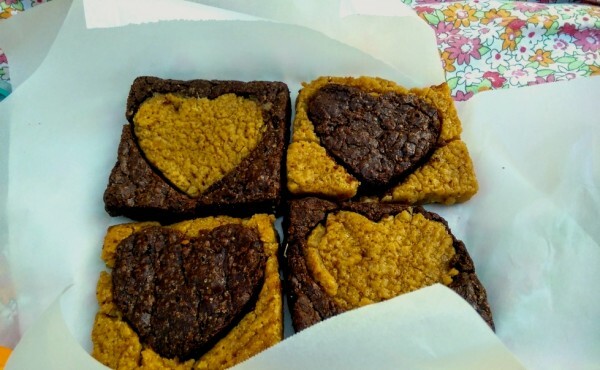 Still cold (and if they warm up and soften too quickly, pop them back in the freezer for 5 minutes), carefully, slowly and gently, press your cookie cutter into the center of each brownie and set the cut-out aside. Insert the dark cut-outs into the centers of the light brownies, and vice-versa. From here, you can let them warm up to room temperature or wrap them up in the freezer until you will need them. On Levitt lawns, the senses come together and create happy memories that stay with you wherever you go. 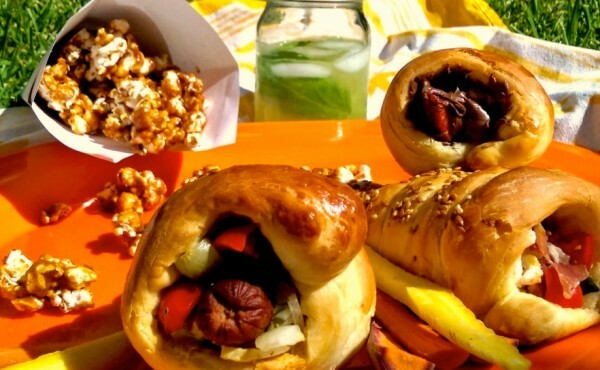 With summer coming to a close, be sure to try out these tasty recipes at your next Levitt concert and enjoy a sensory experience that will remind you of picnicking fun all year-round! Still hungry? Feast your eyes on our collection of picnic basket recipes on our Pinterest! And if you have any favorite recipes or photos that you’d like to share, comment and let us know. This entry was posted in #musicmoves, Concerts, Levitt AMP, Levitt Artists on August 20, 2015 by Isabella Ramos.